It's getting to be about that time again yes you guessed it. It's time to look for that perfect and special prom dress. A lot of people go out to the store and buy their's but have you ever thought about looking online??? 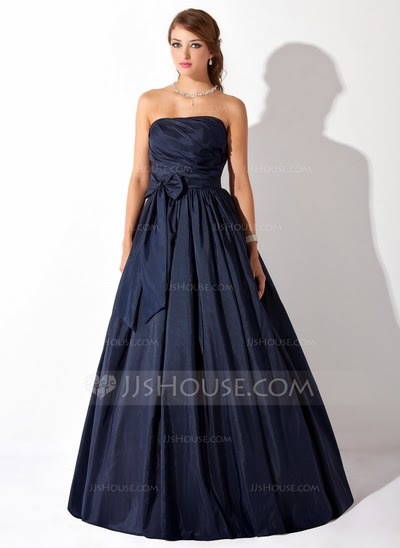 Their is this really great site called JJsHouse and they sell tons for prom dresses for everyone. Are you looking for something with a lot of sparkle, or maybe that certain color, or maybe just something simple they have it all. This dress is really nice and if I wanted something pretty simple this is one I would possibly choose. I usually tend to go for dresses that are strapless but they have more to offer they have dresses with one strap or spaghetti straps, behind the neck they have it all and to top it off a lot of their prices are anywhere from 40% to 60% off not all of their dresses but a lot of them are marked down. I know I would love to avoid the stores this time of year anyway where many people will be out shopping for dresses. They offer over 1,000 styles that can be customized and tailored to fit your exact needs. The last thing you need for your special event is a late delivery of a crucial item (like a wedding dress or essential party supplies). JJ’s House puts your priorities first and ships across the globe with such as DHL or UPS. We provide expedited shipping as well as budget conscious options. So don't miss out on some great deals from http://www.jjshouse.com/Prom-Dresses-c18/ and make sure you get that perfect prom dress that you will make memories for a lifetime. what pretty dresses,my daughter has prom this year..she would want to look at these dresses..thank you for sharing.